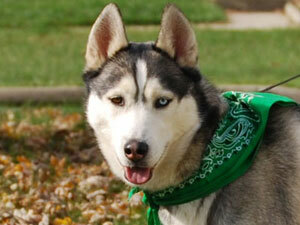 Cyrus is a very handsome Siberian husky who is approximately three years old. He was originally adopted out two years ago, however, his family’s work schedule changed. Cyrus was spending a lot of time alone and his family felt that he was becoming lonely and unhappy. Wanting only the best for Cyrus, his family decided it would be best that Cyrus find a family who could be home on a more regular basis. In addition, they felt that he would also benefit from having a canine companion – and we couldn’t agree more! Since returning to rescue, Cyrus is a happy boy who just loves playing with his new foster brothers and sisters. In addition to playing with his canine friends, he enjoys running and biking (on leash of course). After an active day, Cyrus loves to snuggle up on the couch with his best friends and just relax. True to his name, Cyrus is quite the talker – especially when he wants to play! He is crate trained (although he is probably just fine without it) and housebroken. Cyrus is a typical Siberian husky, so it would be best for him to be placed in a home that is husky savvy. In addition, a yard with a nice sturdy fence and a canine playmate would be perfect! If you are looking for a dog that is past the destructive puppy stage, but still has a lot of energy to enjoy an active lifestyle with the rest of your pack…Cyrus might be just the boy for you!